At Netsterz, we make it our job to listen, to research, and to understand the demands, unique to your business concern. Our mission is to provide cost-effective, creative, quality solutions that aim your goals. Our experienced team of web developers have fine-tuned the implementation process to ensure quick turn-around, smooth deployment and reliable results.on-time and within budget. Experienced : With over 10 years combined experience in the marketplace, we have acquired a dynamic development methodology to identify the proper ingredients that make a successful website. 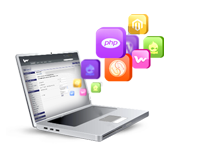 We Don't Outsource : We have our inhouse team of experienced and talented developers. We have our own approach, philosophy, methodology, mission, vision and process. If we want things done the way we want things done, we do it ourselves. Creative & Technical: We are not a team of robots delivering a fancy home page widget to every client. We work hard to understand each customer's industry and their requirement, so that we may bring fresh designs to them—every time. On Time And On Budget: We determine the scope of the web development project, create a budget and timeline, and once they’re approved, we stick to them. Just to make sure, we do weekly status checks on progress and deadlines to keep everyone – you included – on track. Whether you require a full scale E-commerce Store or a customized Web application or simply a static website, our web development team will give you best solution for business requirement. Analytic Thinking: We analyze the technical structure of the web and online conduct of the target market. Strategy : We evaluate and organize the information to design a Web Development strategy that correlates with your web marketing plan. Architecture : We design a blue-print for your site's structure, layout, functionality and back-end systems. Creation : We use the programming language and HTML tools, as well as other information technology, to create and structure the new site. Implementation : We configure the new site to our state of the art, secure server environment and link the website to the domain information on the web. Positioning : We position the website in major SEs for maximum exposure to your target market. Monitoring : We continuously monitor the website and its environments to assure correct parameters at all times.